I gave up making a shell lei. 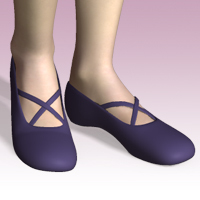 I tried to make the dance shoes. Shabby Shell Lei was made. It has 51296 surfaces. It has almost the same number of V4’s surfaces. The action of Poser became strange when I was making the bone structure to it. Poser6 stopped. The window of Poser7 rotated in accordance with the movement of the mouse. I got Alexa2 with very cheap price at DAZ Store. But now, her item almost disappeared. 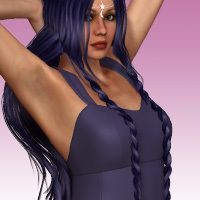 FK Design’s Alyssa for Alexa2 is Freebie now to my surprise. It is very charming character set. I tried to remodel my Muumuu dress V4 for Alexa2. 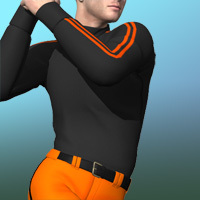 The making of the Baseball uniform came to a deadlock. I tried to make the clothes for V4. I wanted the muumuu dress of the short length. I went to watching a baseball game the other day. The outfielder’s glove is more big than my model. I don’t know why I can’t make a big glove. I want the uniforms of a baseball game. Recently, most of the visitors to this site come from their bookmark link. I thought that the announce at the community is useless any more. So, I am lazy. I am trying to make the baseball uniform for M4 now. I knew that Pranx was being scattered in a file url in RapidShare.com. I listened to the bad rumor of RapidShare.com. It was said that they aren’t cooperative for the infringement of the copyright. HotFile is a proper enterprise! Do you know about the illegal trade of the only one product of trumarcar and me?